Apple and Ridley Scott presented the most awaited event of 1984: the introduction of Apple Macintosh personal computer to the world. With a concept directly influenced by George Orwell’s classic novel “Nineteen Eighty-Four”, Scott offers a heroine who destroys the repressive present led by the Big Brother in order to bring a future full of new perspectives. The world of cycling & triathlon is plunging itself into a world of repressive big brother dominance as the big players such as Wiggle, Evans & even eBay take a strangle hold on everything from buying & selling to training & competing. The Hub is our 1984 moment. Take Wiggle as an example of the bicycle world superpowers. Now I love Wiggle myself but with a turnover in the hundreds of millions it’s a bike superpower. eBay an even mightier goliath now operating with over $8 billion turnover and 35 thousand employees. There are plenty of countries that include fewer people and have lower revenues. What does this all mean to average Joe cyclist who loves cycling but isn’t tripping over himself with Pinarello Dogma’s and spare cash to throw at the latest set of ZIPP’s? It means getting value for money isn’t always straight forward and retaining your unique identity as a cyclist isn’t always that easy. Trivelo Bikes Ltd was “born from an egg on a mountain top”; much like Monkey in the 1970’s. The more straight forward explanation was that following countless issues buying & selling bikes getting ripped off or narrowly avoiding duds we decided we had had enough and set up our site with a goal to help people buy and sell bikes simply, safely and for free. We all love a bit of triathlon at Trivelo so our natural focus tending to support triathletes in this mission but welcoming all other fellow cyclists with a warm bosom and mobile optimised customer journey. Over the past couple of years we have built up a wonderful network of fellow independent businesses striving like us to change the way people buy cycling kit, train, upgrade, compete or anything cycling related. 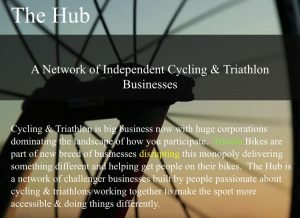 Which has lead to us now setting up The Hub to help share the value in this network with our community of over 10,000 cyclists. The Hub is a network of independent cycling & triathlon businesses who do things differently, who just like us have grown tired of the big boys pushing us around as consumer ants and who have worked all hours to disrupt the cycling monster conglomerates. We are working to discover more of these kindred spirit businesses and share information about them so you have more choice and can wrestle back power getting the customer experience you deserve. A customer experience that is a personal one delivered by companies who’s ethos means your business matters to them. If your reading this and are one of these businesses contact us and find out how we can help you and join The Hub. You will find details about these companies shortly from our main site where you can reach out and try them for yourselves. There is another way and its The Hub. About the author – Billy is the founder of Trivelo Bikes and the energy behind envisaging and setting up The Hub. Lezyne 800XL ReviewDo you need to give up drinking when training for a triathlon?